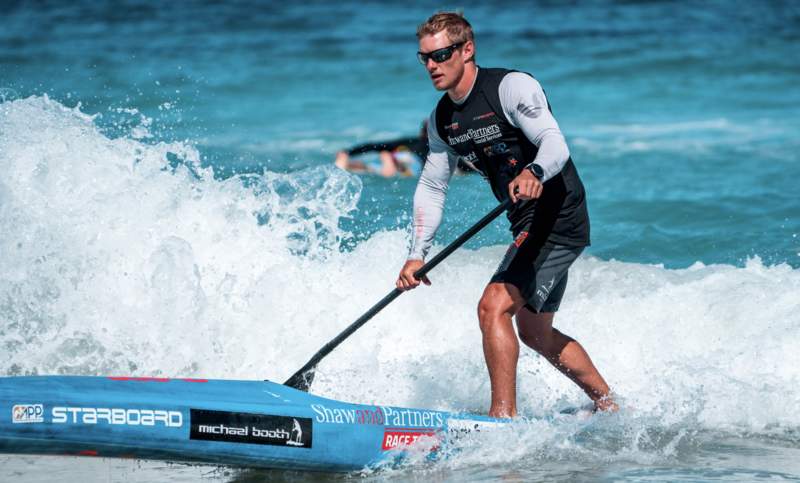 A first-time champion of the Carolina Cup and member of the Starboard Dream Team, Michael Booth logged an impressive SUP season in 2018, winningeleven of fifteen starts on his race calendar. In addition to the Carolina Cup victory, Booth won his third Australian Distance Race title, second Euro Tour Championship, and second World Title ISA distance race. Although sprinting is not his specialty, Booth focused on the APP Tour for the first time and achieved remarkable results, netting a season-end ranking of second-place worldwide. “Absolutely. My offseason has been a bit all over the place with lacking motivation after a big year last year, and then, unfortunately, getting an injury that put me out for a month. However, everything is back on track, the fire is there, and I can’t wait to get on the start line in April. “I think the best strategy you can have going into any race is being confident with your preparation and knowing when you put your foot on the line, you are the best you can be. I know I won’t have it all my own way on race day, so my strategy will continuously be changing depending on what is happening around me. At the end of the day, I just want to go out there and do my best performance and if that’s enough for the win that will be a bonus. “Perth has a consistent trade wind from the Southwest for about 4 months over the summer months. It is known as the Fremantle Doctor, as the mornings are generally hot and then in the afternoon it blows through and cools everything down. The similarity with the conditions was that in Wrightsville and Perth, the wind comes over your left shoulder and generally there isn’t a lot of swell. So, this gave me great confidence when I looked out on race day last year. “Not too much. After my last event in Paris at the start of December, I put the paddles down and had an extended break until I felt the desire to paddle again. It’s a long season that’s incredibly draining physically and mentally. So, when I get to that point, I try to learn and master a new skill or sport, and for me this year it was downwind foiling. When I start back training in the pre-season, I really try and mix things up, and this year I am doing kayaking for a lot of my base fitness. “I think I won 11 races last year from 15 starts which were beyond my expectations. I earned my third Australian Distance Race title, my second Euro Tour, and second distance race World Titles. I also focused on the APP for the first time, and I came away with second overall which is a major achievement, as my specialty isn’t sprinting. “I didn’t really have any disappointments in 2018. I was really proud of my season, and I know every race I went in I did the best I could. There’s nothing more satisfying than that. “To be the best I can be, work on my weaknesses, and be focused and ready every time I put my foot on the starting line. Titles are great, but the personal satisfaction of knowing I couldn’t do anymore, regardless of the results, is the best feeling I can have. “I don’t really feel like a role model as I just feel like another person who loves paddling and enjoys meeting people with similar interests. I try and be my best each and every day, and I really like helping others achieve their potential. I’ve been coaching people for the past couple of years through my online platform [Training by Boothy]. I honestly get most of my satisfaction seeing other people achieve results. Everything I portray is authentically me, and if that inspires or helps someone reach their own personal goals, that’s truly winning. “I think the sport is constantly winding its path in continual growth. As an athlete, I feel like there are more and more great paddlers coming through in the professional side, and you are always looking over your shoulder to see who the next superstar is going to be. There are events all over the world every weekend, and we are fortunate to be able to pick and choose which event suits our goals and aspirations. “I think cohesion it’s the ultimate goal for the sport of SUP, as there seems to be a lot of players that aren’t working together to achieve success. The sport is still young and teething, and all good things take time. What I notice is people want short term solutions and aren’t looking at the end game where we should be focusing our attention. I think more rules, class decisions, ruling body’s and restrictions on board design will all be positive additions to the sport. “In the background of my sporting career, I’ve been slowly building a paddle brand called MB Paddles. This brand is a design collaboration with well-known paddle producer Gara Racing Paddles. I have always loved design and enjoyed creating things, so it’s awesome to be able to share that passion with the everyday paddler. Combined with my coaching site [Training by Boothy] I am able to help everyday paddlers across the globe reach their goals.